In the study of the idol of Ganesha we have noted that his head is that of the holy elephant which is the symbol of the world. The trunk in the head represents the manifestation of three Nadies, Ida, Pingala and Sushumna according to its twist. The broken tusk represents the shedding of the ego and the remaining single tusk represents the nondualistic nature of reality. The mouse represents the moochakam the thoracic cavity the power house of the life's breath for the body's daily activities. 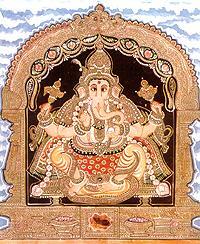 The serpent girdle just above the mouse, though on the body of Ganesha represents the coiled energy called kundalini. In occultic parlance Kundalini is considered as a mystic fire without smoke which underlies all forms of life. Kundalini energises the entire body. The wise will keep it under control at level with the diaphragm and not allow it to go below where the stomach and sexual organ are situated. It is the essence in the practice of yoga that this energy should be lifted up and shut in its original hole in the cortex of the brain where from it descended, to awaken the dormant power within us. There are many other details in the imagery of Ganesha which could be interpreted as consistent with the sublime ideals that he represents. For example a student of yoga is expected to practice ahimsa and refrain from taking animal food. Significantly enough the elephant which has given its head to Ganesha is a vegetarian and the mouse which is a natural food for serpent is seen living in perpetual amity with the serpent girdling Ganesha's waist or hanging down with lifted hood across his shoulder. Natural animosities are forgotten as was said by Prophet Isaiah "The wolf and the Lamb shall feed together". The ideal of peace is proclaimed and the image of Ganesha can also be taken as a proclamation of this ideal of peace of Ram Rajya or the Kingdom of Heaven on earth.